We tried to unify the project structure as much as possible. If you’re familiar with /api-public/v2/projects/ endpoint it should be simple to execute any operation with project. Basic project information is available in the standard json format. More advanced concepts (personnel costs, billing, …) are defined in items. You can define an activity, a person and a task. We recommend to create just leafs though. Activity budget represents an aggregation of personal budgets. The personal budget is an aggregation of tasks. This way, you can just create the leaf and the activity/person is upserted. Every activity has a name and an hourly rate. The existing client rate is used if the hourly_rate is missing. If you create a new activity without an hourly rate, zero rate is used. It is necessary to specify the email, names, role and salary for every new person. The role, salary and names are used only when creating a new person. An existing person is never updated! The same person definition can be used in responsible_people field. Tasks are assigned to a person and activity. A parent can be referenced by ids in the item or by a name/email in the relevant field. References are also described in shortcuts. Partial updates are supported. Please see the example in billing. Every project has one discount. No ids are used, there is only one amount that needs to be adjusted. Be aware that revenue (personnel costs + project expenses - discount) cannot be smaller than billing. Below you can see what fields are required for each budget type with activity hourly rate. You can send for example person hours budget to timesheet budget, but we’ll ignore it (webhook would contain zero hours budget). You don’t have to worry about different client rate, if you create just leafs! Budget is defined in person and activity item. Take a look at personnel costs. Hourly rate or budget amount is ignored. Tracked time is never billed! You can use shortcuts when creating a new project or experimenting with the API. This is an experimental feature for developers. If you don’t like it, you can use the standard formats returned by the API. Be aware that shortcuts are only used in requests. A response always contains standard item definition. We’ve built Harvest projects importer during development of the new API, try it at https://harvest.integrations.costlocker.com (source code). 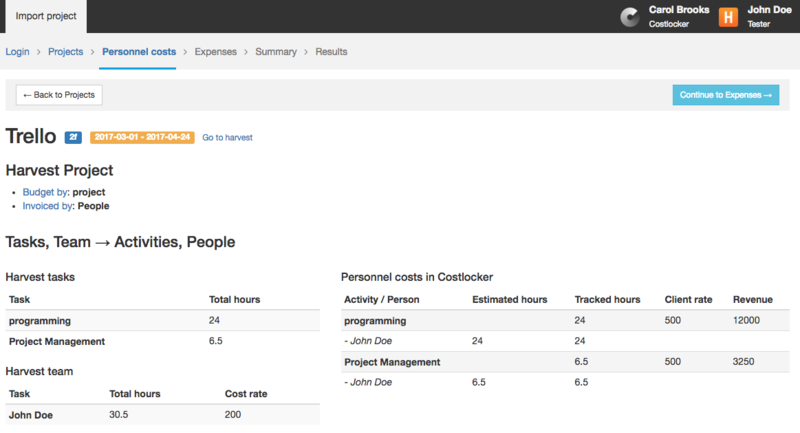 Let us know if you’ve created similar application that connects Costlocker to a project management tool!